Sometimes going through our daily routines can cause us to fall into ruts and lead us to question the importance of what we do. We need to especially fight against such feelings when it comes to spiritual routines and routines of service to the glory of Christ. It is in these spiritual routines of service that God defines the success of believers. 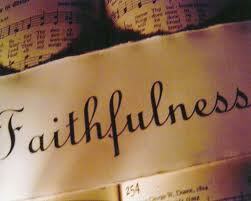 “Moreover it is required in stewards that one be found faithful.” (1 Cor. 4:2) As I’m reading “Shepherding the Church,” Joseph Stowell recounts the following powerful story of how routine faithfulness pays eternal dividends. “It was Dwight Lyman Moody who led Wilbur Chapman to the Lord. Wilbur Chapman became a great national evangelist in the generation succeeding Moody’s. During Wilbur Chapman’s ministry in Chicago, a baseball player with the White Stockings had a Sunday off, as all professional ballplayers did in that day, and was standing in front of a bar on State Street in Chicago when a gospel wagon from the Pacific Garden Mission came by playing hymns and inviting people to the 2:30 service down the street. This ballplayer, recognizing the hymns from the home he grew up in, attended that 2:30 service and received Christ as his personal Savior. That afternoon encounter with Christ dramatically changed the life of Billy Sunday. He played ball for two more years and then left professional sports to minister in the YMCA in Chicago, which was then a fine and effective organization for Christ. Wilbur Chapman came through town and talked Billy Sunday into joining his crusade team as an advance man to help organize the pastors and set up Chapman’s meetings. Billy Sunday enthusiastically agreed. Upon signing up with Chapman, Billy Sunday received word that Chapman was going to leave evangelism and take the pastorate of one of the leading churches in America. This left Billy Sunday stranded, but he refocused his efforts on national crusade evangelism. He soon began scheduling his own meetings, which launched his ministry across America for the cause of Christ. In one of his meetings, a young man by the name of Mordecai Hamm accepted Christ. Mordecai Hamm became a great evangelist in the Southeastern United States, ministering to massive crowds south of the Mason-Dixon line. One night in one of those large crowds, a young man and his friend came forward to accept Christ. One of those young men was Billy Graham. Moral of the story? NEVER underestimate the power of your routine faithfulness to Christ because routine faithfulness to Christ pays eternal dividends.